The Ancient Maya were extremely precise in their time measurements, and their calendars reflect the fractal intelligence of Nature. The 5,125 year cycle is made up of 13 smaller cycles, known as the "13 Baktun Count." Each baktun cycle is 394 years long, or 144,000 days. The Maya calendar was adopted by the other Mesoamerican nations, such as the Aztecs and the Toltec, which adopted the mechanics of the calendar unaltered but changed the names of the days of the week and the months. 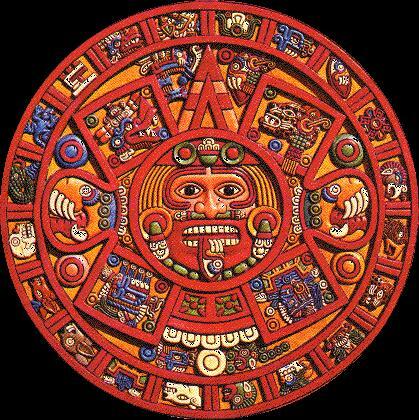 The mayan calendar ends on 21st December, 2012 which is predicted to be the end of the world. Astronomers generally agree that "it would be impossible the Maya themselves would have known that," says Susan Milbrath, a Maya archaeoastronomer and a curator at the Florida Museum of Natural History. What's more, she says, "we have no record or knowledge that they would think the world would come to an end at that point." 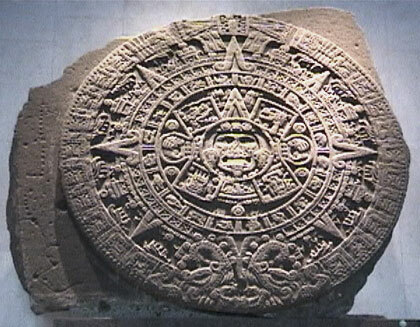 The belief that the ancient civilization's calendar predicted doomsday was perpetuated by a group of Mayan scholars in 1996, when the 13.0.0.0.0 date was found carved on a stone plaque in a building in Mexico. As the Ancient Mayan Time Map reveals, the start of the Great 5,125 year Cycle in 3114 BC coincides with the beginning of recorded History. Since then, as a human community, we have been in an ongoing acceleration process known as Civilization. The Tzolkin is a 260-day calendar based around the period of human gestation. It is composed of 20 day-signs, each of which has 13 variations, and was (and still is) used to determine character traits and time harmonics, in a similar way to Western astrology. The Maya also used a 365-day calendar called the Haab, and a Venus calendar, plus others. They measured long time periods by means of a Long Count, in which one 360-day year (a "Tun"), consists of 18 x 20-day "months" ("Uinals"). The 12-month Gregorian calendar is not based on logic, science, or nature. It denies and covers up the true annual human biological cycle conserved in the body of woman. Although there were only 365 days in the Haab year, the Mayas were aware that a year is slightly longer than 365 days, and in fact, many of the month-names are associated with the seasons; Yaxkin, for example, means "new or strong sun" and, at the beginning of the Long Count, 1 Yaxkin was the day after the winter solstice, when the sun starts to shine for a longer period of time and higher in the sky. When the Long Count was put into motion, it was started at 7.13.0.0.0, and 0 Yaxkin corresponded with Midwinter Day, as it did at 13.0.0.0.0 back in 3114 B.C.E. The available evidence indicates that the Mayas estimated that a 365-day year precessed through all the seasons twice in 7.13.0.0.0 or 1,101,600 days.